This week on #MeetAScientist, we're excited to introduce Laura Osburn. As a social scientist, Laura uses her expertise to find strategies to build smarter buildings, advocate for science through storytelling, and help lead the 500 Women Scientists Seattle Pod. When did you first identify as a scientist? Can you talk briefly about the work you've been doing now at CERC? So, first, I identify as a social scientist, and a qualitative one at that. Being a social scientist, particularly one that takes an interpretive research approach, means that I don’t necessarily fit the popular (or for some, academic) definition of a scientist. I don’t do experiments, I don’t use control groups, and I often don’t develop hypotheses. What type of methods I use depend on the questions I want to ask about the people that I study. While I’ve had experience working in multiple methods, my methods of expertise are ethnography, case studies, and narrative analysis. So the data I collect and analyze are the things that I see, hear, and read. At the moment, my field sites are primarily workplaces and classrooms. Which brings me to CERC (Center for Education and Research in Construction). We’re an applied research center that focuses on the people and practices in the building industry. There, I work as a research scientist that acts as the center’s resident social scientist. I take part in a broad range of activities including collaborating with faculty on project ideas, collecting data, managing projects, writing and editing publications, and mentoring graduate students on research methods and human subject research ethics. I also co-lead our center’s Communication, Technology, and Organizational Practices (CTOP) lab, which focuses on the work that people do to make technology work: the innovations that occur when people use, integrate, or repair technology. We are particularly interested in helping people collaborate better when using new technologies so that they can build better, more energy efficient buildings. What does it mean to be an expert in "the use of storytelling for decision-making?" Why and how does one cultivate that sort of expertise? Storytelling is a central part of our human experience. We tell ourselves and others stories about who we are, what we do, and why we do it. Being an expert in the use of storytelling for decision-making means understanding how people use stories to make strategic decisions on any number of things, from determining the boundaries of one’s social community to deciding what energy designs should be developed for a building. And by storytelling, I don’t just mean, someone sits down and tells someone a story. I am also talking about the social interactions that go into the everyday stories that we tell one another to make sense of confusing situations and give sense to others about problems and solutions. As for why one cultivates that expertise, I suppose it has to do with having a passion for reading, listening, and watching people tell stories! As for how one cultivates that expertise, my path has been a bit eclectic. I received my Masters in Comparative Religion, PhD in Communication, and now work in Construction Management. In each of these disciplines, I have continued to focus on the stories people tell and their relationship to technical and/or organizational decision-making. For example, for my dissertation, I studied how activist websites used stories and hyperlinks together to establish allies, attack the opposition, and mobilize activists. Now in my current work on building teams, I focus on how teams tell each other stories about clients that lead to energy design decisions. So if you want to cultivate this sort of expertise, I suppose you have to follow the stories regardless of the context in which they are being told. 500 Women Scientists Seattle gathered around for a social. Why did you join 500 Women Scientists? I think in terms of our occupation, our commonality is that we are all doing systematic, evidence-based research or applying that research in some way, such as with our teachers or engineers. For those of us working at university, we also have to deal with similar challenges when working in academics. One of the main reasons I was drawn to this group, though, is because I wanted to find a way to encourage people who do research and have specialized expertise, to take part in our public debates around policy and not be afraid to have an opinion. Those of us, particularly in academic communities, are often taught to remain passively objective and always mindful of the nuances surrounding our subjects of study. Yet, when it comes to taking part in public conversations around policy, you need to have an opinion. You can’t just sit there and say, “well, there’s a lot of nuance”. You have to be able to tell people what your research means, why it matters, and based on that, what we should do about a problem. Sarah Myhre, who nominated you for our #MeetAScientist, described you as the logistical backbone for the Seattle Pod. Can you talk about your activities there and any lessons learned? I think of myself more as one of the logistical vertebrae. We have a very strong and dedicated strike team that together make up the logistical backbone of this group. What is great about that is, when things in life go sideways, you can always depend on the team to help. In terms of my personal logistical activities on the team, I ran our fundraiser and helped get our pod’s website up and running. I also tend to be an avid meeting minutes person. As for lessons learned, the first would be to cultivate strong team relationships through meetings and informal social events. Also, meeting minutes are good. If you don’t do them, you won’t remember what decisions were made. 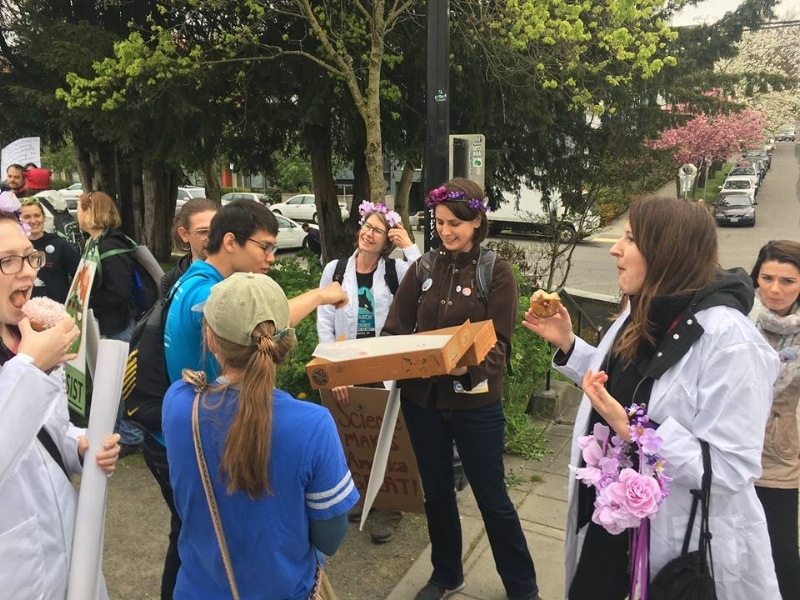 500 Women Scientists Seattle and Postdocs United co-hosted a Making Science Work for All event. What do you think we as women have to bring to the table as science advocates and communicators? So first, I think it is difficult to say that there is some one thing or set of things that all women, regardless of their intersecting identities, have in common that we bring to the table. I know what I can bring to the table as a science advocate, but everyone is going to bring to the table something different. Second, I think questions like these can imply that we need to demonstrate our value as women to validate our right to be at the table. We should have equitable representation at the table simply because it is the right thing to do. I think what’s really important is when we ask ourselves, “what do I have to bring to the table," we remember that our work, expertise, perspectives, experiences, and ideas matter. They are of great value to science and society. We deserve to be at the table and when we are not at the table, everyone loses. With all of the work that you've been doing as a researcher and a science advocate, what do you do outside science to unwind? Two things: Playing piano and watching Star Trek with my cat. Laura Osburn is a research scientist at the Center for Education and Research in Construction at the University of Washington. She has worked on research funded by the National Science Foundation, General Services Administration, U.S. Army Corps of Engineers, Sound Transit, and Skanska. She received her Ph.D. in Communication from the University of Washington. You can find her on her website or follow her on twitter @lilaavati.